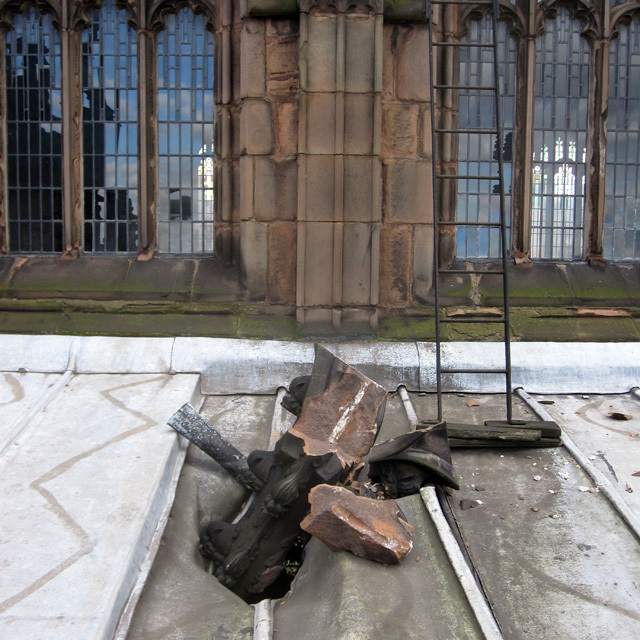 John Cunnington had an urgent early call from Rotherham Minster yesterday, a large piece of masonry had fallen onto the north aisle roof of the grade I listed Minster (amongst Yorkshire's finest parish churches)! John quickly arrived on site to find that the hurricane force winds experienced across much of the country had topple a two metre high stone pinnacle from the nave parapet, from where it crashed through the 15th century lead roof taking with it a lead spout and the end of a gargoyle. Fortunately, most of the damaged stonework was left wedged into the hole in the roof and contractors are now working to secure the area so that the church can reopen to the public. As architects to the Minster, we will be working closely with all parties to undertake a full repair of this key part of Rotherham's heritage reusing as much original historic fabric as possible that can be salvaged from the wreckage.